Holy smokes, I haven’t posted in so long I don’t know if I remember how. Part of the problem was my internet connection. It had become so slow it took forever just to download pictures. We finally got a new provider and things are somewhat better. I did get my Old Voices New Impressions quilt top assembled. I am pleased with the way it all came together and very happy I went with the green border fabric. 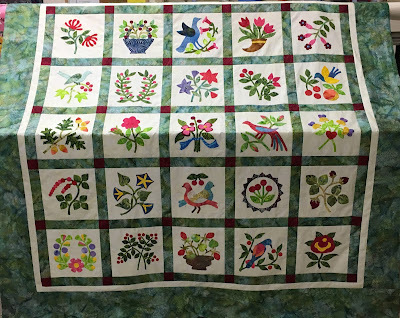 It’s not too noticeable in the pictures but in person the center of the quilt looks like it is floating on the green border. 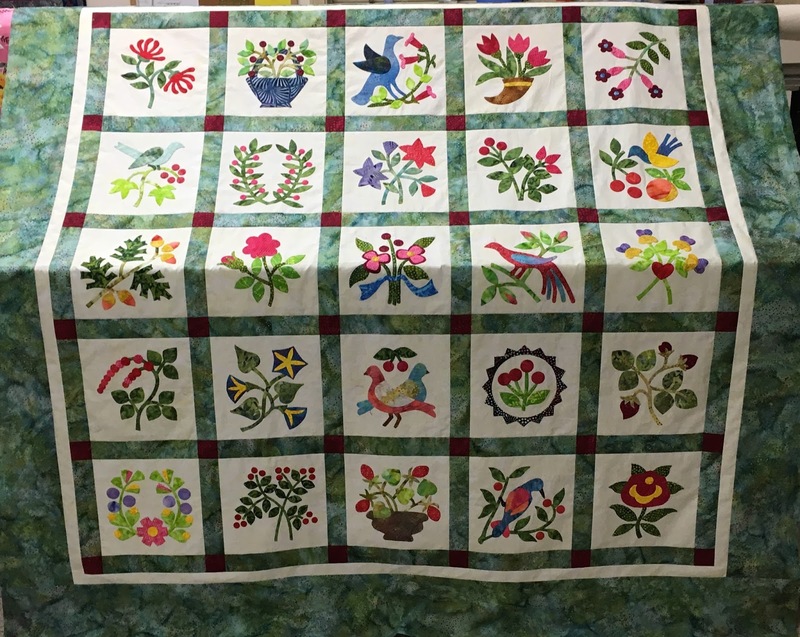 Karen from Log Cabin Quilts started this sew a long in July 2015. I wasn’t a very good member because I failed to post my progress each month but reading about the other ladies progress kept me motivated. So thanks Karen for all your inspiration. 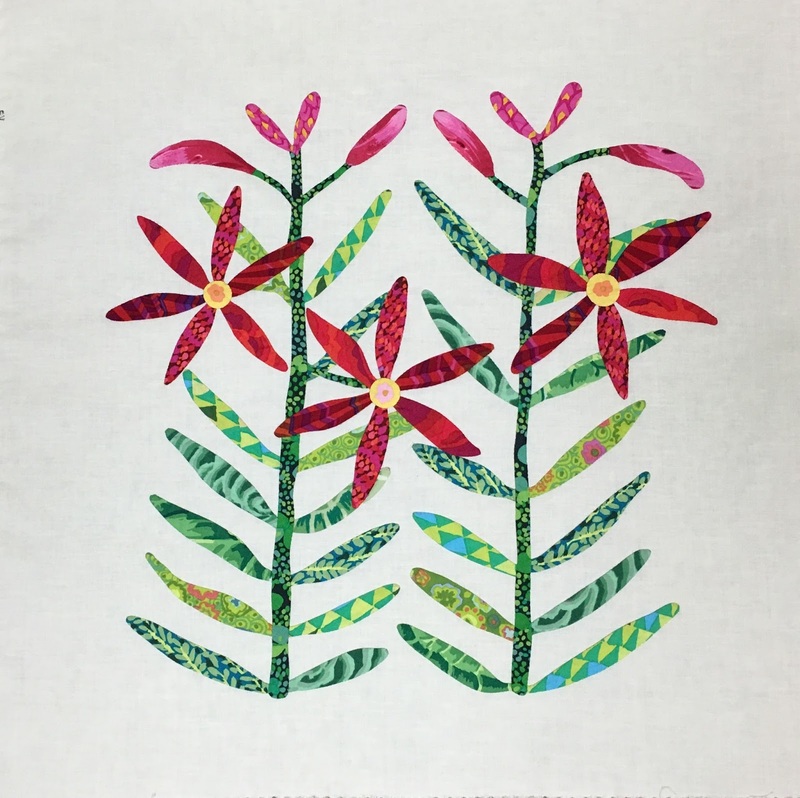 Tiger Lily block for the Shenandoah Valley Botanical Album Quilt. It was supposed to be posted on the 15th so I guess I am a little late. At least I made it before the May block came out. You can see some nice pictures on their blog showing this block in many different fabrics and there is a Facebook page here for this quilt. 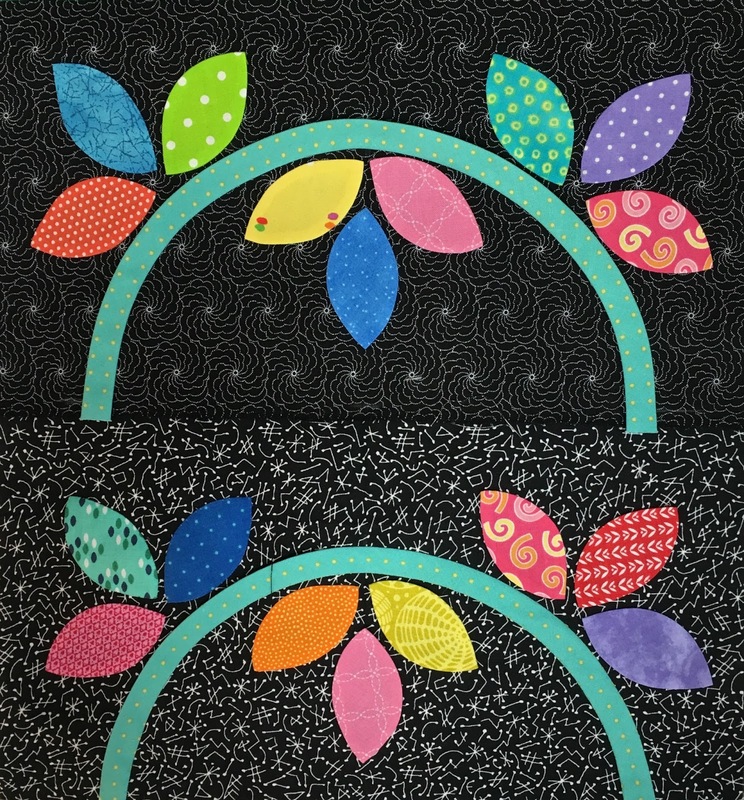 I also stitched a couple of the wreath blocks for the Sarah Fielke BOM. We need to make 8 of these wreath blocks . I will need to stitch 16 because I am making two color ways but I have 8 months left to get them finished. 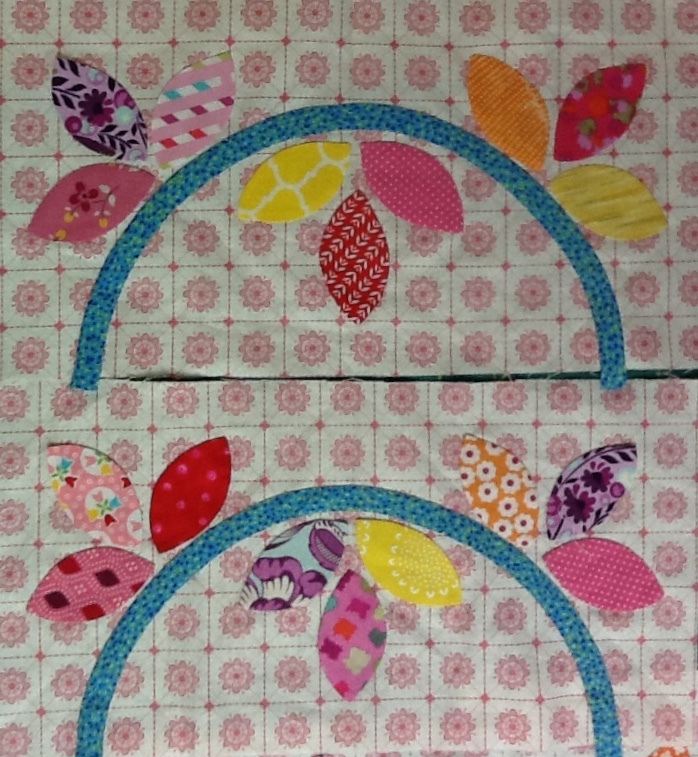 The blocks for this month were both applique . 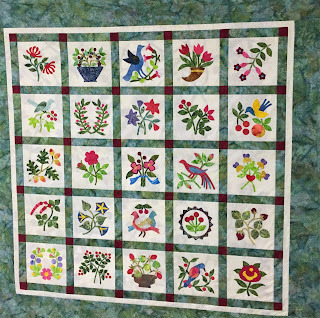 This quilt has a very whimsical and happy look. I guess this is why Sarah has named it Happy Days. There is also a Facebook group for Happy Days here where you can see many different versions of the quilt. I am always amazed at how creative some people are. Facebook is the other reason I have become lax at blog posting. I never was a fan of Facebook but so many of the groups I follow have moved there so I was kind of forced to give it a try. I am still a little concerned about privacy issues so I rarely post anything. It’s not as bad as I had imagined but it sure can eat up a lot of your time. So pretty - your decision to "go green" is perfect! 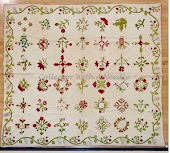 The sashing & borders really make the applique blocks shine. I am with you about FB - have totally cut out most postings except for family & the 3 quilt groups that I am part of - they are low key, always inspirational and not overly heavy on postings. Your Old Voices New Impressions is just gorgeous!!! Wow - so beautiful! 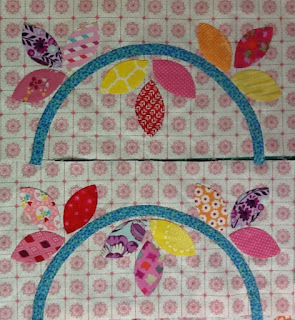 I like the fabric choices you made on your latest Happy Days - looking really good! Beautiful quilt top, Nancy! Just gorgeous! 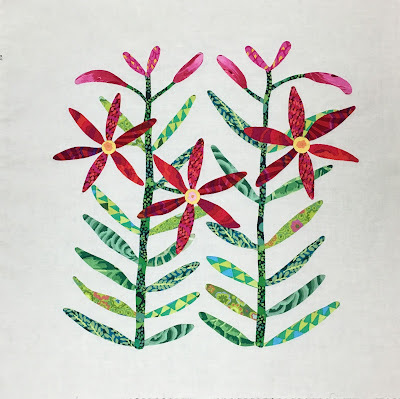 The Tiger Lily block has really caught my eye--no matter who has made it ion what fabrics. It is so pretty. 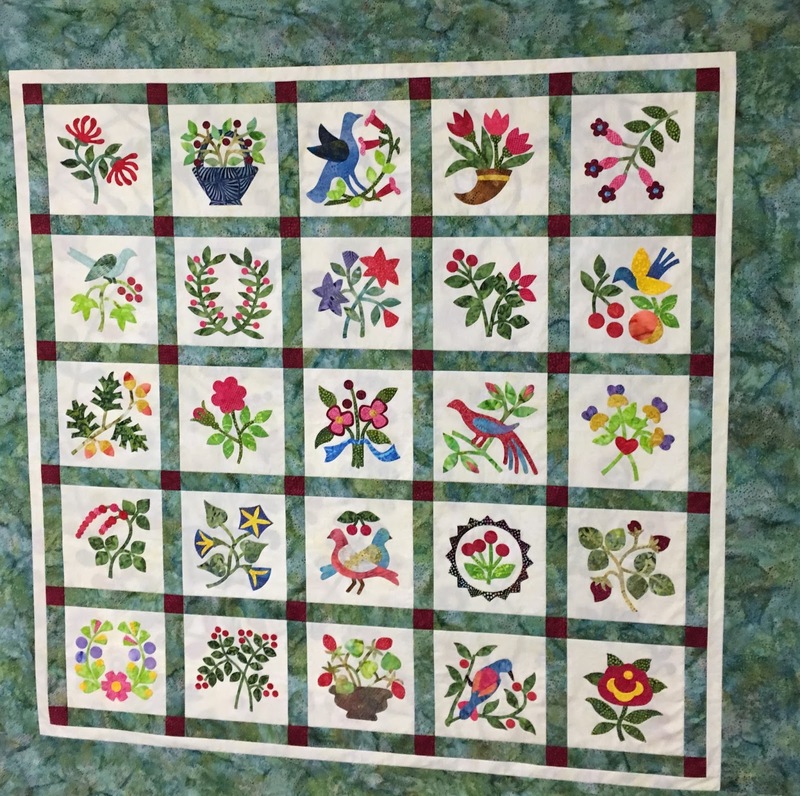 Oh, Nancy, your Old Vocies New Impressions quilt is fabulous!! And your Happy Days blocks are so fun!! 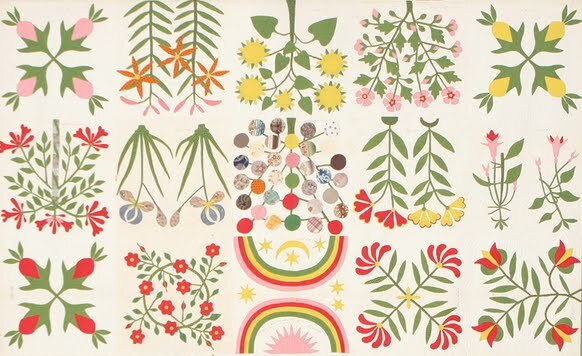 I especially love the birds and flowers on the black dot!! And I know what you mean about Facebook - wayyyy to easy to waste some time there!! :-)) Off to check out Happy Days on the FB!! Your Old Voices turned out stunning! 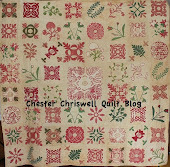 And your Tiger Lily is gorgeous too, I just added it to the end of month post on the SVBAQ blog! LOVE your Sarah Fielke blocks as well. You've been awesomely busy! Nancy añoraba tus entradas de blog!!! What a beautiful finish for Old Voices. The green border is lovely and let's the block shine. It's hard to keep up with everything, but I do love seeing what you're working on. I love all of these gorgeous applique blocks! :) What a beautiful finish with tht green border; just perfect! Stunning quilt and love the other blocks. I love the green and bet it does look like all are floating in the green! You did a wonderful job! Hats off to you. Your Old Voices top is so beautiful...congratulations! Great projects Nancy. I love all of the color. Your Old Voices quilt top looks very good with the green. I still haven't sewn my blocks together. Too many other projects have kept me hopping and the sewing machine cabinet covered with pieces and parts I did not want to put away. I need to either clear the cabinet or get out another sewing machine (and I have plenty to choose from) so I can sew the blocks together.